Local authorities sit at the fulcrum of big decisions on intelligent transport systems. So what’s it all about and what could you be doing about it right now? A good place to start is to wrap your head around what’s driving intelligent transport systems (ITS) in the first place. According to US transportation secretary Anthony Foxx, “saving time, saving lives and saving fuel” are the reasons behind a proposal to spend nearly US$4 billion to accelerate the adoption of connected and driverless vehicles in his corner of the world. In part, the US government and others are being pushed into action by organisations such as Google and Tesla, and by many of the traditional manufacturers that are already testing various levels of autonomous and connected vehicles. Add to that a forecast population growth in urban centres that will put an unsustainable strain on infrastructure and produce transport bottlenecks that are a burden on citizens and the economy. Additionally, in the US alone over 25,000 traffic-related deaths occur every year, which translates to an economic impact through wage loss, property damage and medical expenses of over US$250 billion according to the National Safety Council. Global traffic-related deaths top 1.2 million according to the World Health Organisation. In Zealand and around the world, governments, councils, town planners and related agencies are under pressure to find more effective, safe and sustainable transport solutions. Many are increasingly turning to technology collectively known as ITS. Many now argue that this now needs to be considered as part of all major council transport and town planning discussions for its impact on budgets, quality of life, and environmental protection, not to mention economic prosperity and growth. ITS New Zealand promotes the benefits of ITS technology and contributes to international dialogues. The organisation includes consultants, private businesses, government and regional agency representatives. It’s part of an Asia-Pacific network within a global grouping of organisations working with governments and companies to help promote and guide the adoption of such technologies. ITS New Zealand chairman Peter McCombs says ITS is an increasingly vital part of New Zealand’s transport networks and is a core consideration in major transport infrastructure projects, “contributing to improved safety and efficiency and helping councils and transport agencies get the best from new and existing infrastructure”. The Wellington Smart Motorway, on SH1 between Johnsonville and the Terrace Tunnel, is New Zealand’s most comprehensive ITS project. The scheme involves integrated and networked smart technologies including sensors, cameras, Variable Message Signs (VMS), speed and lane control signals, and automated enforcement systems. Controlling the speed and lane controls is an Advanced Traffic Management System which receives data from detectors under the road and radars mounted on lighting poles and gantries counting vehicle numbers and their speeds. Based on historical modelling the system then identifies anomalies and trends which lead to congestion and adjusts lane speeds to pace the traffic and delay the formation of stop–start queues. New Zealand’s first smart motorway. Ngauranga to Aotea Upgrade. Securing VMS into place. From loop detectors and radar, to Bluetooth and CCTV there are a range of systems available to measure the traffic on our roads. The resulting data is used both to manage the road networks on a day-to-day basis and to plan how, when and how much to invest in improving and expanding the networks. New Zealand company AraFlow has Bluetooth beacons throughout the country, anonymously tracking vehicles which emit Bluetooth signals and measuring travel times in both urban and intercity locations. As part of this network its results provide the journey time information on the Transport for Christchurch website. In Auckland, HP has been working with Auckland Transport applying its Future Cities surveillance technology which overlays CCTV and social media inputs to help gather data which can be used to inform and alert transport network managers. At the cutting edge of sensors, NZTA has trialled a system which uses fibre-optic cable buried by the roadside to “listen” to the traffic. The Distributed Acoustic Sensing system can use existing fibre, which is often buried beside the road, and can identify incidents affecting normal road use and send alerts to traffic management teams. Examples of ITS improving the safety of our road networks can be found throughout the country, not just within the city limits. In January, NZTA activated a truck warning system at a tight bend on SH2’s notorious Rimutaka Hill road near Windy Point making the road safer for all road users. A seemingly simple system, it nevertheless incorporates solar power, sensors to gauge the size of approaching vehicles, electronic signage and communications systems which relay the status to the Wellington control centre. Possibly the most remote, but no less technical, are the ITS installations on the Milford to Te Anau road. On a high profile route renowned for its variety of challenges the ITS hardware here includes CCTV cameras, weather stations, snow and avalanche sensors, VMS signs for conveying road conditions, and a variety of technologies to maintain communications around the Homer Tunnel. In 2014 the Ministry of Transport released an Intelligent Transport Systems Action Plan and is actively seeking local and international partners to test technology here. At transport.govt.nz/futures the ministry is engaged in some informed crystal ball gazing to identify how the exciting new transport technologies will be relevant to New Zealand in the future. The Ministry of Transport and Civil Aviation Authority recently released new laws around unmanned aerial vehicles (UAVs) or drones, which many are predicting could become the couriers of the future as well as being very useful for commercial applications in rural areas. Meanwhile, NZTA is supporting several trials of new technology, such as the DAS fibre-optic sensors and the RouteTIP app in Christchurch, which works like a VMS, sending short safety and journey time messages to mobile phones. It is also supporting research into the readiness of our roads for autonomous and connected vehicles and plans to work with the Ministry of Transport on regulatory clarity. 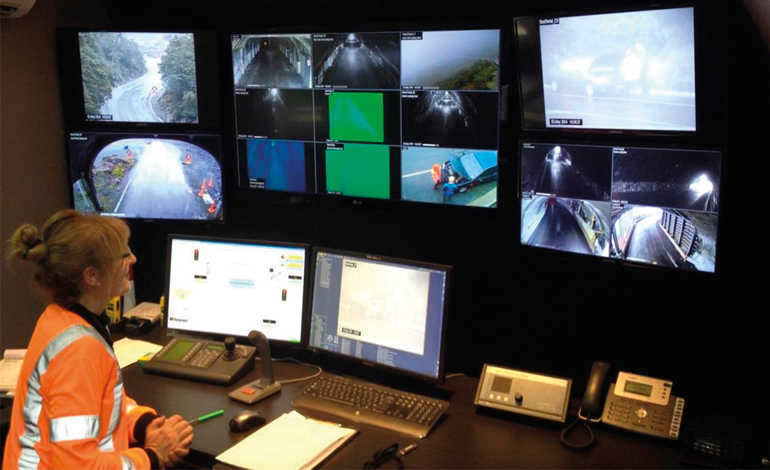 The control room for the Homer Tunnel on Milford Road. 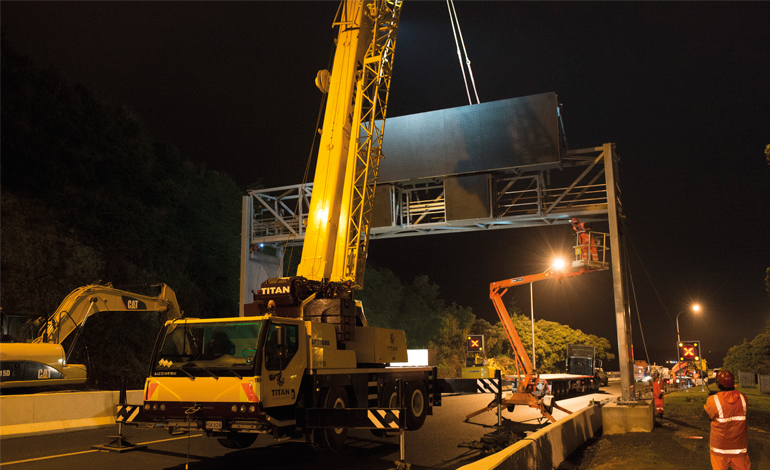 NZTA is working with the industry to develop an ongoing framework for New Zealand ITS standards which will be useful to those tasked with provisioning, management and maintenance of ITS technology. It is seeking engagement to help develop the framework and interested parties should register at https://itsspec.nzta.govt.nz. ITS New Zealand coordinates a calendar of events and presentations by industry experts throughout the year including an annual full-day summit. The events and regular communications from ITS New Zealand provide an opportunity to network with peers and stay up to speed on ITS developments here and around the world. ITS New Zealand is also hosting the prestigious ISO TC 204 meeting in October, developing international standards for ITS. Keep up to date with events and announcements at www.itsnz.org. 4. In October this year the ITS World Congress takes place in Melbourne. Tipped to attract approximately 10,000 delegates, the event will showcase the latest technologies, research and trends in transport technology. ITS New Zealand will be there along with some of New Zealand’s own ITS innovators. The website for more information is www.itsworldcongress2016.com.